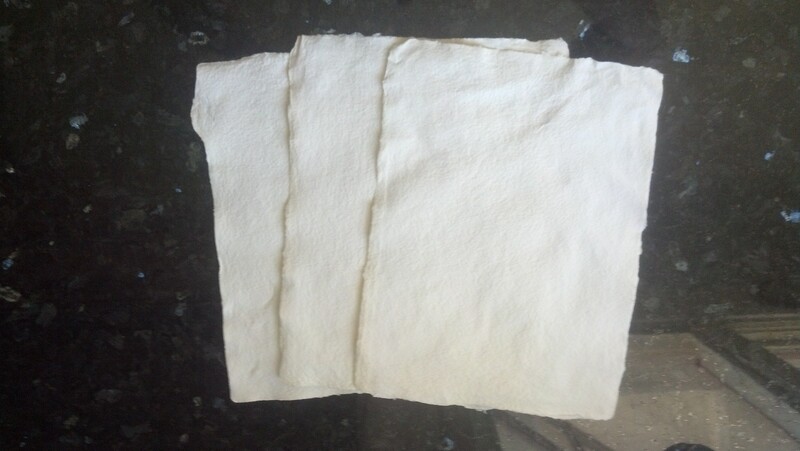 This part of the blog can be divided into two sections: an experiment in papermaking that my hubby did and a modern “cheater” version of paper making. I had never made paper before, so I read both modern and historic accounts of making paper, and talked to professional paper makers. I first experimented with making linen pulp. I bought some used handkerchiefs at a Goodwill store and cut them into pieces about 1 inch square, wetted them with water, and put them in a plastic bag on my back porch for a week. I made a small stamper by using a section of 2” pipe and putting a cap on one end. I then selected a wooden dowel large enough to fit loosely into the pipe. I added some of the very smelly and moldy cut up linen and water to the pipe. Next I started pounding the linen with the dowel. I checked the consistency of the fibers after 30 minutes. Hardly any change had happened, so I pounded the linen for another 4 hours. At the end of 4 hours some changes had started, but the fibers had not yet become untwisted. I decided that the speed of manufacture for the linen pulp was too slow and purchased some beaten flax fiber from a commercial supplier. I eventually made about ¼ cup of pulp suitable for making paper, but it took over 10 hours of pounding to do so. I made a vat using a large plastic storage box with folding top. I filled the vat with water and added the purchased flax pulp and my ¼ cup of pounded rag. The whole amount of pulp was thoroughly stirred into the vat. Next I used a purchased mould to begin my paper making experiments. The basic dipping process is to lower the mould perpendicularly to the vat surface until it’s completely submerged. Then “roll” it so that it becomes horizontal and then raise it to the top of the vat. Paper pulp will have been retained on the screen surface. Next raise the mould clear of the pulp keeping it level and shake in all directions to consolidate the fibers. My first few dozen tries at making a sheet of paper were failures. I either didn’t keep the mould level when shaking it (causing the paper sheet to have a wedge shape), shook it too hard causing the paper to tear before I’d even completed the moulding process, or created some other defect that ruined the sheet. Once I could obtain an acceptable layer of pulp, I started couching the paper. I cut all of my undyed felt into 12×16 inch pieces, dampened the felts, and made a stack next to my couching area. I used a piece of plywood as the base and put one piece of felt on it. Then I dipped a mould, consolidated the pulp by shaking it and let it drip. Once the paper had stopped dripping excessively, I removed the deckle frame and inverted the mould over the felt. I used a sort of rocking motion to place the paper on the felt. Once the mould was flat on the felt, I pressed the paper firmly against the felt and again used a single smooth rocking motion to remove the mould leaving the paper behind on the felt. I continued making layers of felt and paper to make a post. Once I had about 40 pieces of paper in the post, I put a top piece of plywood onto the post and used C-clamps to press the paper. The post compressed in height by a factor of 5 or 6, which surprised me. I tried a variety of methods to dry the paper: I hung 4-5 sheets together on a rope, hung individual sheets on a rope, and placed individual sheets onto a piece of cloth to dry. The rope method failed except when I draped the sheet over the rope. The historical references mentioned pins used to fasten the sheets to the rope. The pins tore through the paper as it dried. I tried clothes pins which also failed on individual sheets. I was able to make multiple sheets dry together using pins, but they stuck together making the paper useless. The only method I’ve been able to make work consistently is to dry the paper on a piece of cloth. I believe that the problem with the other methods is that my paper is too wet because I can’t press enough water out using the C-clamp method. Although I did not plan to make writing paper, I decided to try pressing one piece more than the C-clamps could by using my car. It’s obviously an imperfect solution to the pressing problem, but it was the only way I had to put more pressure on the paper. I took one of the pieces of paper, wet it with water until it had the same consistency as the semi-dried paper when I originally made it. I put the paper between two boards and drove my car onto the board and let it sit for 30 minutes. The pressure wasn’t even on the boards, but you can see on one edge that the paper can be made to be very flat and smooth. Other portions of the paper are rougher , due to uneven pressure. The plywood bent as the car went onto the boards and the car was on the most even part of my driveway, but it was still on an angle. The second problem was with the mould. Period “laid” moulds were made of wires that were parallel and closely spaced. Modern “wove” moulds are made from screen. I used a purchased wove mould to make this paper because of the cost for a laid mould. The wove mould cost about $30 while a laid mould was over $800. I built a laid mould, but the close spacing of the holes (about 18 to the inch) made the frame warp. I will use mahogany for the next frame since it has better working properties. I also need to experiment more with ways to make the tension consistent between the wires. The laid frame did not work because I could not maintain adequate and even tension on the brass wires. I used 16 gauge wire but the movement of the wood caused warpage of the wire spacing. Paper making attempts using this mould failed because holes formed in the paper during moulding and it tore very easily. It did not consolidate well due to the uneven wire surfaces.